Mayo and I have rolled out from Madison and onwards towards Canada and Alaska. For the first day, we did an easy hop, figuring that the morning would be frantic and we’d get a late start. The Winnii once again had excellent road manners. It’s much more like driving a Toyota truck than some of the bigger Class C’s that I test-drove. The only tricky part is keeping it in the center of the lane (especially going through barrier-tightened road construction in high winds, whee, fun), and backing up. 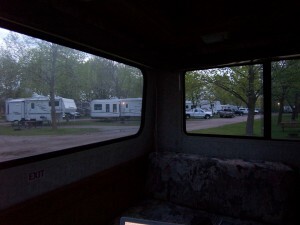 We’re staying the night at a KOA (a nice, friendly, clean and safe campground, not to be confused with a Wally World parking lot because the campground’s store does actually close at night and the tree-to-pavement ratio is higher, it has showers, and it’s about a mile further out of town). This is the type of camping that is one step removed from a motel room. But for starting out slow and easy, it feels right. This picture should give you an idea of the campground. It’s from my bed looking out at our neighbors (the 5th-wheel set–ah, the ratchety racket of idling diesels in the morning–it smells like luxury. Well, dinner is done, and I’m feeling lazy, so TTFN. Next post from somewhere North.